This post is a little “off-topic” for Live Simply. I’m not a blogger blog, how-to blog, or a money blog. I’m simply a mom who loves kombucha, butter, and homemade lotion, writing a blog that’s grown larger than I ever could have imagined. Today, I’m changing things up. Don’t worry, I’ll be back with a really cool (and simple!) DIY later this week, but today, we’re going to talk about the hush-hush “m” word…money. Before I talk about the how, let me just stop here and clarify this whole money-making thing. In April of 2013, I started Live Simply. I didn’t know what I was doing as a blogger. My mom and grandma were my only two readers, and I didn’t have a clue that money could be made from a blog. I started Live Simply with one important asset…passion! I was passionate about my family’s real food lifestyle, the homemade soap I made in my kitchen, and our quest to simplify life. I personally believe passion is how every successful blog grows and thrives, and yes, eventually even makes money. But, the desire to bring in the green should not be the reason a person starts blogging, nor what fuels a blogger to continue writing each and every day. I get it, but here’s the deal. Live Simply didn’t make money for the first twelve months of existence. Nope, not one single penny. I put long days and nights (many sleepless) into Live Simply before this blog ever made a penny (literally, a penny). I’m not looking for a pat on the back, but, rather, I’m saying this because blogging is hard work! Yes, it’s awesome that I get to spend my days writing about simple, natural living. Yes, the perk of stashing 10 pounds of butter in my fridge for “recipe testing” is amazing! But, there have also been many missed play-dates, beach outings forsaken, and long nights of editing and writing after the kids are in bed. All this to say, blogging is fun, but it’s also a lot of hard work! If you start a blog with the number one desire of making money, you’ll soon be disappointed by the amount of work involved and little compensation for many months (even years). Passion is what will keep you going! Since starting the blog, we’ve outgrown three servers (as of 2016, we’ve outgrown two more servers). 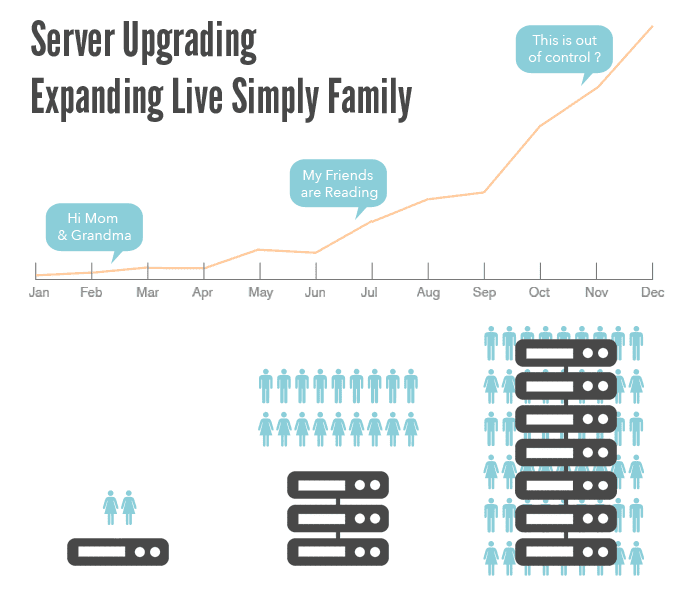 Upgrading means paying more with each server upgrade to maintain the blog. A great “problem” to have! Over the summer, I realized that the Live Simply family desired more than what I alone could provide on the topics of natural, real, and simple. I decided to bring on three team members, including myself and Dustin. These team members help with admin work, recipe development, social media, and graphic design. These passionate team members are paid. The beautiful photos, food, and DIYs found on the blog, all cost money to consistently create, test, and share. Camera gear must be maintained. 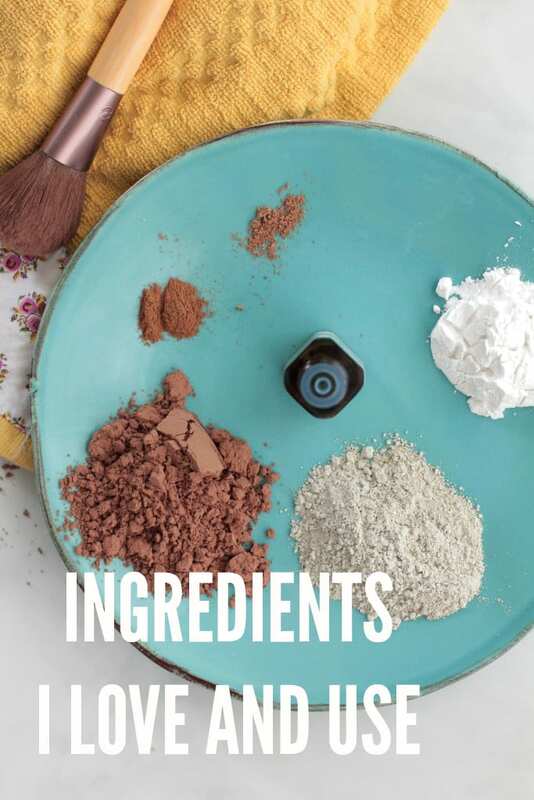 “Props” (AKA, plates and bowls that haven’t been chipped and glued back together) and ingredients must be purchased, often multiple times due to multiple testing of recipes. I’m so thankful for the expenses. They are a welcomed sign that Live Simply has become a blog much larger than just myself, with a family of readers making a difference in homes and communities across the world. But these expenses also require money. So, the big question: How does one make money in an authentic way without selling out, staying true to readers and a passion for sharing life? Today, I’m going to very honestly answer this question. I should also note, before moving on, that the money made here at Live Simply, all goes back into the “company” (that just sounds way too formal) right now. 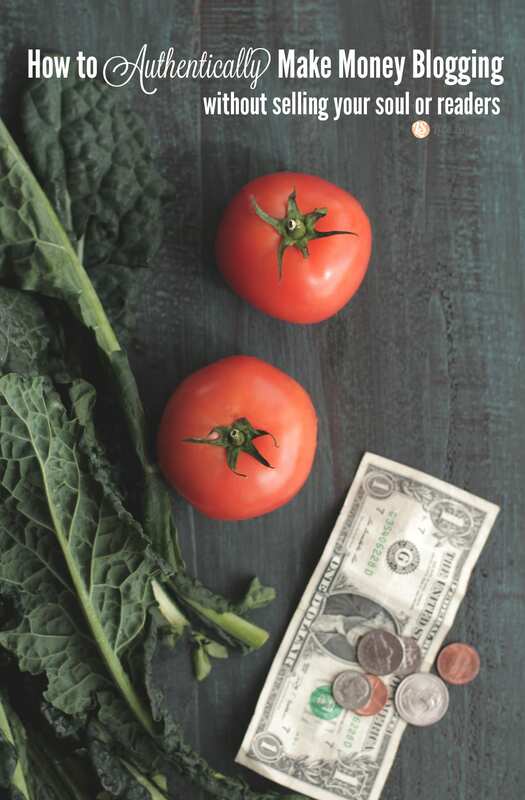 Maybe someday I’ll get a paycheck from Live Simply, but for now, we choose to reinvest in Live Simply to continue bringing our readers the best of simple, natural, and real food. The ads on my sidebar are placed by an ad network or networks. 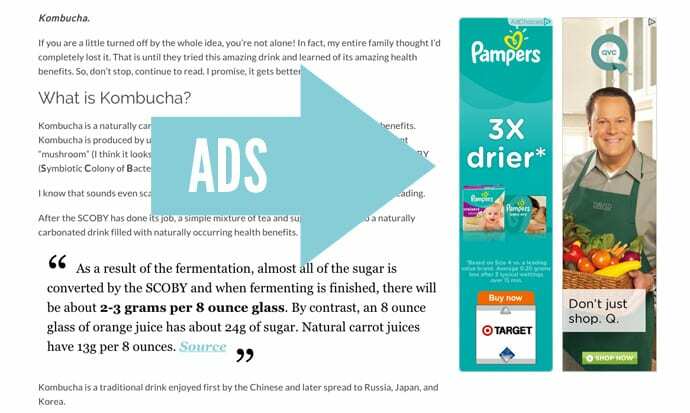 These companies service ads for many different companies, but we try to define our terms: no processed food ads, indecent ads, pharmaceutical ads, etc. There have been times when ad networks have manipulated our contract and placed unwanted ads on Live Simply, but we’ve promptly contacted the ad agency when this has happened, even removing the ad network if necessary. We could add more ads (with broader ad content), but we don’t want to take away from Live Simply or the message we promote. After all, you come to Live Simply for recipes, DIYs, and simple tips. You don’t come to Live Simply to stare at a million different ads that go against our message, whether serviced by an ad network or sold directly to companies. Dustin (my husband and all-things tech/design guy) and I are very protective over the space here at Live Simply, including ad placement and the ads being serviced. You may have noticed that we don’t use ads on Live Simply’s homepage or main category pages, because Live Simply is not about money, we are about you and sharing our journey of simple, natural living! 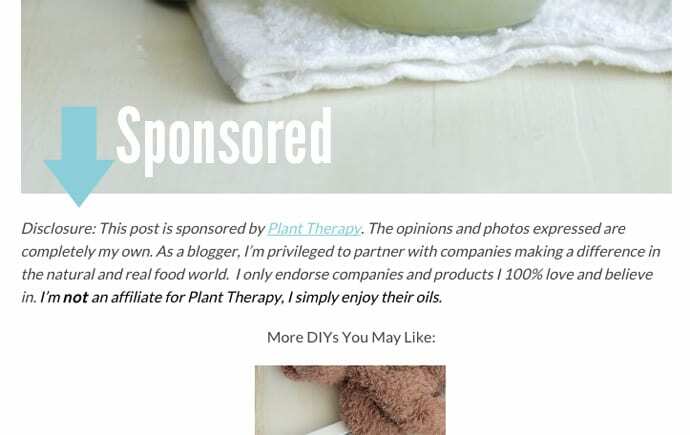 The ads that are serviced are an easy way for Live Simply to receive income and support the blog as they don’t require you to click or buy anything. Side Note: If you ever see an ad that is disturbing or just annoying (like a video ad) please contact me. As a young child, I always dreamed of writing a book when I grew up. I’ve always loved writing and sharing stories. 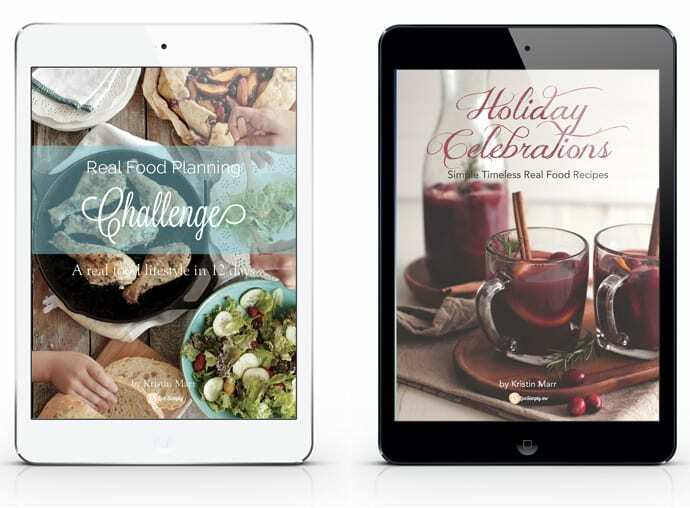 Two months ago, I self-published my first eBook, Real Food Planning Challenge. I truly had no idea how much work goes into writing a book until I actually sat down and started writing, creating printables (actually Dustin did that), and editing. There were many days that I felt like giving up, but I pressed on. Finally, the 130-page challenge was born! Despite advice to charge more, we wanted to keep the book very affordable for our readers, so we priced it at a low $8.99. This week, another Live Simply eBook was published, Holiday Celebrations, a holiday cookbook featuring 32 of my favorite recipes (no longer available). We also kept the price very affordable at $3.49 or free with the purchase of the Real Food Planning Challenge. Both products authentically provide extensive help on real food topics, at an affordable price, while supporting Live Simply. Live Simply also makes money through affiliate programs. An affiliate program works by a company selling products and allowing a blogger to make a commission when someone purchases a product from the company. While there are many affiliate opportunities available, I believe a blogger should only focus on the opportunities they truly love and use. For Live Simply, this means Amazon. I’m frequently asked about the products I love and use. With Amazon, I’m able to share the very products I use, giving you a choice to buy the product through Amazon or shop around locally or from other online resources. When you click on an Amazon link here at Live Simply, we receive a small commission (4-7%) on your purchase (there are exceptions). While I love Amazon, I’ve noticed a recent craze in the blogging world to link anything and everything to Amazon just to get clicks and hopefully, money. This is the wrong way to use Amazon and not authentic, in my humble blogging opinion! Using Amazon to share products a blogger naturally uses and loves, which will help readers in making a recipe or finding a tool, is very useful. Randomly suggesting any and every product on Facebook or “funny” blog posts, just to get clicks and hopefully money, only leads to distrust. The same goes for books and bundles. Here at Live Simply we only recommend books (and occasionally book bundles) that we truly love and enjoy! Books aren’t recommended to make money, rather to enrich your life. 2016 Update: We no longer work with sponsors/brands on Live Simply. Instead, we’ve focused the time we spent on sponsored work toward freelancing. We feel this is a better use of our time, and offers a more authentic blog experience (our number one goal) for readers. When this statement is posted at the bottom of a post, it means I worked with a company (usually receiving payment and product) for the post. I have very strict standards when it comes to working with companies and will only work with companies offering products I personally love and use in my home and kitchen. Live Simply could make a lot of money by working with any and every company who solicits a partnership, but I don’t find this authentic or trustworthy. Soon, accepting every company offer, leads to endorsing products just because they pay. I would rather not work with companies then promote products just because they are free or the company compensate monetarily. Along these lines, I also believe company posts should always benefit you! 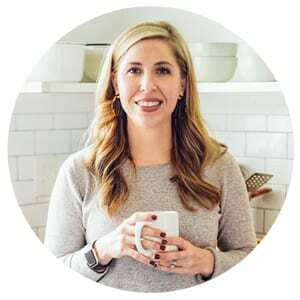 This means company sponsored posts are always ideas that originated here at Live Simply (not something a company pushes on us) and truly help the Live Simply community: recipes, DIYs, and useful tips. One of my favorite ways to earn money is through freelance work. Freelance work usually involves, for me, recipe development and photography for food and natural living companies. These recipes and photos rarely make it to the blog and are usually specifically requested by a company (using certain ingredients, etc.). While freelance work technically doesn’t involve Live Simply as a blog, all the companies I work with have found me through the blog (photos and recipes). I have three purposes for writing such an “off-topic” post. First, is to provide bloggers with authentic ideas for how to make money on a blog. A blog that’s first driven and written by passion, not the desire to monetize an online space. Second, I want to provide you, as a reader, with an honest answer for the question, “How do you make money here at Live Simply?”. You are always my first priority and the reason Live Simply exists, to share the passion of finding simplicity in natural and real food living. As a family, honesty is always important. Third, with the many holiday parties approaching, the question of “What do you do for a living?” always comes up. Let’s just say “I’m a blogger” is a very unconventional answer. As I shared earlier, the next question is always related to money. So, this post is my answer to you, the sweet lady in the reindeer sweatshirt at last week’s party. I never get tired of reading how fellow bloggers are doing it (and, in your case, doing it very well!) – thank you for sharing your encouraging story with us. It’s obvious that you (and Dustin) have worked extremely hard to build a site that is not only beautiful but such a valuable resource to your readers! You totally deserve it being “out of control” and becoming such a financial blessing to your family! Thank you so much, Dena! It’s been such a blessing this year to watch the blog grow and monetize. It’s amazing how natural the monetization has been too as we focus on what we love doing, and doing it with all our heart in a very authentic way. I’m so thankful for blogging friends…how we can help each other, bounce ideas around, and encourage one another. Thank you so much, Daisy. I’m so glad the post was helpful. I agree, I don’t think many people realize the huge expense that goes into blogging. I love that blogging can be a channel for helping people, sharing life, and often generating an authentic income. Thank you so much for this! I love how you talk so much about really being authentic, I think that is a hard balance, but so important! Thank you, Emily. You’re so very welcome! It’s been amazing to watch how the more we focus on doing what we love and being authentic, has meant not only growing the community here at Live Simply, but also monetizing the blog. I think passion and authenticity are the biggest keys when it comes to blogging, particularly in the busy online world of today. Thank you so much for this Kristin! I can tell you were a bit hesitant about an “off-topic” post, but I think it reflects your authentic personality that we your readers enjoy. You’re not trying to hide anything, and a lot of your readers are bloggers so these are things we can relate to. Honestly it makes me feel better knowing you have a little help with your blog. I know how time consuming each of my posts are on top of my work and mom schedule and I find myself reading your beautiful blog going “how in the world does she do this? !” So thank you for giving us a peek behind the curtain! Thank you so much, Claire. I’m so glad the post gave you a behind the scenes look too. I’ll admit, recruiting help for the blog was not an easy task (I’m a huge control-freak, in the very best kind of way ;)), but finding amazing, passionate help has been one of the biggest blessings this past year, allowing me to focus on what I love most (recipes, writing, and photos) and delegating the other tasks. Awfully illuminating thanks, I do think your current visitors may perhaps want a whole lot more content such as this continue the terrific effort. I can relate to the awkward challenging of explaining blogging – although I haven’t had to explain it to anyone wearing a reindeer sweatshirt yet. LOL! Seriously, this is such a wonderful, authentic post and I so appreciate you sharing this so that more readers will get a better understanding of why bloggers who are mission-minded do have to balance it with earning income to keep pace with the expenses of blogging the time commitment it requires. You are one of my most favorite bloggers (is that grammatically correct?) and I am always blessed by each visit to your site! I’m so thankful to God for blessing you with continued growth. You have such a beautiful talent for inspiring us to find contentment in living simply with glory to God. Thank you so much for blessing us with the work of your hands and heart here! great information to help new bloggers start making money with their blogs. I’ve been generating income online since a couple of years (blogging since 4). I have positive experiences with sponsored posts. I just saw your blogging advice column and love it! This is such a good piece you wrote. I love your honesty. It has been a subject I’ve had to answer as well, sometimes uncomfortably. I always tell people, it’s my passion and that’s why I do it. Especially since having my daughter last year, I realized I wanted to pursue more meaningful work and help people navigate green living. You are such an inspiration to me! Keep being real and honest! Thank you so much, Suzi! I look forward to following your blog more. Your passion is truly evident! This was extremely helpful! Thank you so much for sharing! How do you start the process of affiliates, sponsored posts and freelance work? For affiliate opportunities, I recommend thinking about what you love (and recommend) and the products that fit with your site/brand. For example: I make a lot of DIY products for my home and share the recipes on the blog. Amazon carries 99.9% of the products I use and recommend, so I’m an Amazon Affiliate. I recommend limiting the number of sponsored posts you take, but to get started, simply contact your favorite companies (that also fit your brand/site) and ask to “work together.” This contact often leads to paid sponsored content-recipes, tutorials, etc. that provide value to your readers and represent the company you naturally love. Freelance work, in my opinion, may come your way over time as you put your best work out “there”- your blog, working with companies, teaching local classes, etc. Thanks for sharing your thoughts, Brenda. I enjoyed this post although I’m finding it late in the game:) Yes, blogging is expensive and absolutely most people who enjoy my content probably have no clue that it costs me a lot in time and money to provide that free content:) I am super resistant to ads but do like affiliates and am writing an e-book to hopefully help cover my blogging costs. Great plan, Krista! We try to keep ads very minimal and non-invasive, but they can definitely be annoying if they aren’t done correctly. I appreciated this post despite the fact that I’m thinking that its late in the diversion:) Yes, blogging is costly and completely the vast majority who make the most of my substance presumably do not understand that it costs me a ton of time and cash to give that free substance:) I am super impervious to advertisements, however, do like members and am composing a digital book to ideally take care of my blogging costs. My husband and I recently started a blog just because we thought we would enjoy it (we love it! ), but we wondered if we could monetize it as well to generate a little bit of extra income. I was researching if it was even possible to actually make money blogging with integrity and authenticity. I was getting discouraged at all of the “blogging blogs” as you called it, great term, by the way. I am so grateful to have found yours. It has encouraged us that we can, in fact, make money while still being authentic, honest, and respectful to readers. Thank you! I will be following you now! Thank you, Jennie! I’m so glad the post was encouraging.